Hi there, and thank you for joining us! In part two of our blog series, we will explore more helpful ways to prepare your car for bad weather. As mentioned in part one, we at West Texas Windshields know that the weather here in San Angelo gets pretty intense around this time of the summer. With severe thunderstorms, the threat of tornados, and being right in the heart of the 2017 Atlantic hurricane season, our community will continue experiencing rowdy weather between now and November. Let’s take a look at how you can prepare your vehicle for inclement weather because when a storm is coming, you’ll want to be prepared with the tools and supplies you need while on the road. Make sure your dashboard vents are working properly so that you can use your windshield defroster. Often times when it’s raining, both the front and rear windows get foggy which can make it very difficult to see what’s on the road in front of and behind you. For a quick fix, lower the temperature inside your car quickly by turning on the defrost vent with cool air and cracking a window (depending on how hard it’s raining). This will help reduce the fog gathering on your windows. If you have a rear defroster, check that it’s working to help keep your back window free of fog. Inspect your battery for signs of corrosion, dirt, or any other issues that might hinder it from functioning properly. If you see corrosion, clean off the battery. Do the battery cables and clamps appear to be frayed or badly corroded? Is the battery case cracked or appear to be damaged in any way? If you’ve answered yes to any of these questions, it might be time to clean that battery or replace it. The last thing you want is to be stranded on the side of the road with a dead battery in the middle of a tornado warning! Always keep a first aid kit in your car because you never know when you’ll need it. Unfortunately, road accidents are a terrifying reality and the chances of getting into an auto accident increase during bad weather. A first aid kit can help treat minor injuries sustained in a car accident and can really help while waiting for emergency workers to arrive. You can pick up an affordable, pre-stocked first aid kit at any gas station or grocery store, or you can build one yourself. Either way, they are great to have around in case of an emergency. Always keep a few bottles of water in your car, too. Tool kits are also great to keep in your car. You never know when you’ll need a specific tool to repair or replace an item on your vehicle. Stocking your tool kit with basic tools such as a multi-head screwdriver and wrench, a tire pressure gauge, clamps, work gloves, and a flashlight. If you have to pull over during a storm to change your headlights, you’ll want to make sure you have the necessary tools to do so. 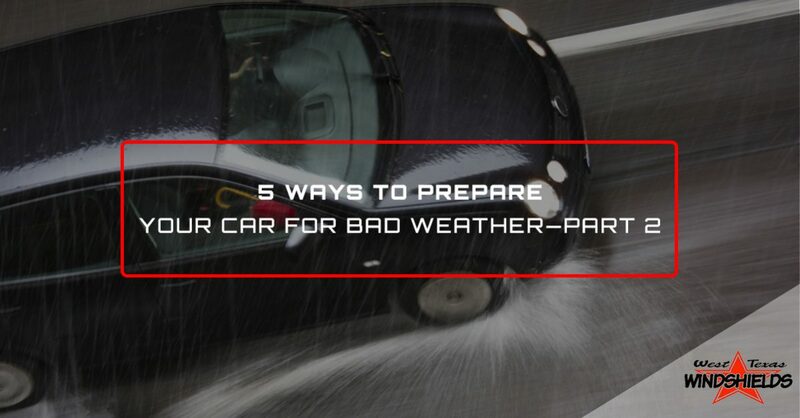 This concludes our short blog series exploring helpful ways to prepare your car for bad weather. We hope you have found these tips helpful because we want to help you stay safe out there during all weather conditions. If you experience windshield damage as a result of inclement weather, contact our experienced auto glass technicians at West Texas Windshields in San Angelo to schedule an appointment for a windshield replacement.